Invertebrate Medicine, Second Edition offers a thorough update to the most comprehensive book on invertebrate husbandry and veterinary care. Including pertinent biological data for invertebrate species, the book’s emphasis is on providing state-of-the-art information on medicine and the clinical condition. Invertebrate Medicine, Second Edition is an invaluable guide to the medical care of both captive and wild invertebrate animals. Coverage includes sponges, jellyfish, anemones, corals, mollusks, starfish, sea urchins, crabs, crayfish, lobsters, shrimp, hermit crabs, spiders, scorpions, and many more, with chapters organized by taxonomy. New chapters provide information on reef systems, honeybees, butterfly houses, conservation, welfare, and sources of invertebrates and supplies. 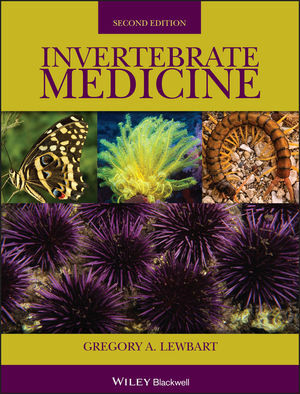 Invertebrate Medicine, Second Edition is an essential resource for veterinarians in zoo animal, exotic animal and laboratory animal medicine; public and private aquarists; and aquaculturists. Gregory A. Lewbart, MS, VMD, Dipl. ACZM, is Professor of Aquatic Animal Medicine in the Department of Clinical Sciences at the College of Veterinary Medicine at North Carolina State University. Laboratory Animal Practitioner says of the first edition: "The real joy of this publication lies in the realization of a nascent specialty in veterinary medicine and our ever expanding understanding of the bio-world that is precious and critical to the earth's survival. "Of course not every known invertebrate phyla and class are clinically represented in the text, but those not reviewed are listed in the introduction and the emphasis is placed on those species harvested for food, captivity, or for research. "This is the first edition of the most comprehensive resource on invertebrate animal medicine. The author and collaborators are to be congratulated for bringing this start of the art effort to fruition in an organized, delightful to read format. This text should be considered as a valuable addition to the lab animal reference library." Exotic DVM says: "This is the first veterinary textbook devoted exclusively to an in-depth review of aquatic and terrestrial invertebrate medicine. "The chapters are well organized and easy to read. There are good reviews of basic anatomy and husbandry and the text centralizes reference in one location for interested readers to pursue more in-depth research. The chapter authors have organized information in a format that will be familiar to veterinarians and emphasize disease conditions where these are known. There is a good review of diagnostic techniques and sample handling at the end. This is an excellent starting place for clinicians that want to expand their invertebrate medicine practice. "If you are interested in working with these species the text offers a great starting point. It will hopefully inspire others to contribute to this growing area of veterinary medicine. The VIN Store (www.vin.com) tells readers: "This book will be of great interest to veterinarians with an involvement in fish medicine, as the book also deals with jellyfish, sea urchins, anemones, corals, mollusks, starfish, crayfish, lobsters, shrimp, crabs, hermit crabs, and many more. "The popularity of spider and scorpions will make this book a necessity for veterinarians treating those species. "Clinicians in laboratory animal medicine will find this book an irreplaceable source of information. "Chapters are well illustrated, although I would have liked to have seen many more of the photos in color. Perhaps the originals were in black and white, but if Blackwell intends to do a second edition, it should think about replacing the b/w photos with color ones. "The lists of common names, drugs/therapeutic agents, common parasites of invertebrate species, legislation restrictions, and the other books and papers on invertebrates listed in the hundreds of references make this a valuable reference in itself. "The overall compilation of invertebrate medicine makes this probably the premier text on the subject. Each chapter seems to thoroughly cover its topic, including natural history, anatomy, physiology, environmental issues, preventative medicine, anesthesia, surgery, treatment protocols, and formularies. "Greg Lewbart did an excellent job of pulling this text together. I would recommend having a copy in the clinic library."